The new dual-track line will connect Copenhagen to Ringsted. Image courtesy of Aarsleff. The Blue flag marks the alignment for the new line Copenhagen-Ringsted and a new station, Køge Nord. Preliminary works of Copenhagen-Ringsted railway got underway with the groundbreaking ceremony in October 2012. The project will see the construction of five tunnels. The Copenhagen-Ringsted High-Speed Railway line is the first high-speed railway in Denmark. The line is being built with an estimated investment of $1.83bn. The project broke ground in October 2012 and is expected to be completed in 2018. Rail Net Denmark (Banedanmark) is undertaking the construction of the new dual-track electrified railway project. "The project broke ground in October 2012 and is expected to be completed in 2018." The proposals to improve the railway transportation between Copenhagen and Ringsted were first made in 1993. The proposed plan was to construct new main tracks between Hvidovre and Taastrup. During 1994-1997, the Rail Planning Committee decided to expand the railway lines in order to meet passenger capacity between Copenhagen and Ringsted. The Committee suggested various options such as expansion with two new tracks. The Planning Act passed in 1997 included the plan to construct a new line between Copenhagen and Ringsted. The Planning Act committee gave three solutions for the project. It included either expanding the tracks by constructing two new tracks alongside the existing lines or construction of two new tracks from Copenhagen to Ringsted via Køge, including an option for the construction of a new station at Køge. A combination of both expansion and new construction were also considered. The proposed solutions were, however, rejected in March 1999. After making several changes in the plans from 2000 to 2009, the project was finally approved with the proposal of constructing two new lines between Copenhagen and Ringsted. The Project received approval from the Danish Parliament under the Construction Act that was passed in May 2010. The construction of a new railway line forms the first stage of the ‘one hour target’ plan, which aims to reduce the passenger travel time from Denmark to cities such as Copenhagen, Odense, Aarhus and Aalborg to just one hour. The existing railway system from Copenhagen to Ringsted is one of the busiest routes in Denmark. It is used by a large number of commuters travelling from Denmark to various cities. The new lines built between Copenhagen and Ringsted will reduce the journey times of passengers travelling between Copenhagen and Haslev (59 minutes to 38 minutes), Copenhagen and Køge Station (38 minutes to 24 minutes), and Hårlev and Copenhagen (61 minutes to 45 minutes). The new dual-track line from Copenhagen to Ringsted will pass through the cities of Hvidovre, Brøndby, Vallensbæk, Høje-Taastrup, Ishøj, Greve, Solrød and Køge. A major stretch of the line will continue along with the motorway network. The new route starting at Vigerslev as a separation from the current line runs towards Vigerslevparken. It continues on the north side of the Holbæk motorway and passes under the road to run along the south side of the motorway to VallensbækMose. Denmark’s capital city, København (Copenhagen), took light rail and metro technology to another level in October 2002 by opening an extensive system capable of being operated entirely without drivers. The project gained momentum through the area to be covered not being on the city’s S-tog suburban heavy rail network. The line then passes over Motorring 4 to follow the west side of the Køge Bugt motorway before arriving at new Køge Nord Station. It will then run along the north of the West motorway to Fjællebro before reaching its ending point at Ringsted. The line will also be linked to a 180km railway line that passes from Copenhagen to the German border. The construction of Copenhagen-Ringsted rail project includes a new 60km dual-track and electrified railway line. It is the largest rail project undertaken by Banedanmark. It will be designed to handle speeds of up to 250km/h for passenger trains. 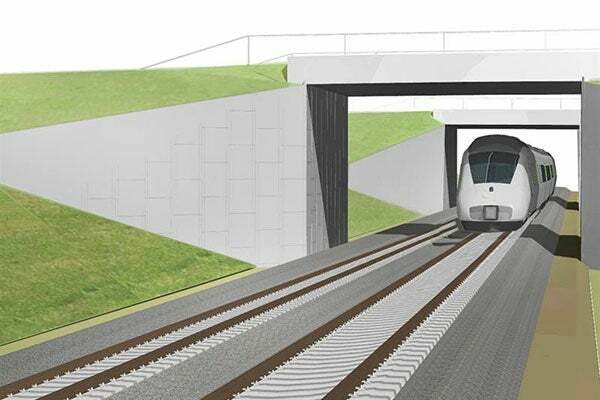 The construction works will involve a new dual-track line between Copenhagen Central Station and Ny Ellebjerg Station, a 2km-long overtaking track in Ringsted station and new platforms at the Ny Ellebjerg Station. The project also includes the construction of a new station called Køge Nord Station by 2016. The new railway track at Køge Nord Station will be connected to the Lille Syd line and Køge-Næstved. An additional track will also be added at Køge Station. Renovation works at Ringsted Station are currently being carried out. Two new tracks north of West motorway to connect Køge Nord station with Fjællebro will also be constructed under the project. The project will see the construction of five tunnels (total 2,000m in length), four bridges (total 1,800m in length), roads, railway bridges and 36 footbridges, passages and streams. The construction will utilise 128,000m³ of concrete, 105,000t of steel, 358,000m³ of gravel and 327,000m³ of chippings. NIRAS provided the preliminary design and project propositions for the Copenhagen-Ringsted rail line. The Atkins-led consortium received a contract to design the first stretch of the railway line in January 2011. Consortium partners include Vössing, EKJ Consulting engineers and Sweco. "The line is being built with an estimated investment of $1.83bn." MT Højgaard was awarded a contract in July 2012 to build four road bridges and railway bridges at Vallensbaek and Brøndby. Aarsleff Rail, a subsidiary of Aarsleff, received a contract from Rail Net Denmark in January 2013 to construct 12 bridges between Ishøj and Greve. In June 2013, a consortium of Barslund and CG Jensen received a contract to build a bridge on Brondby Østervej, a railway tunnel under Holbækmotorvejen, and a passage through Vestvolden.